We often stress the importance of content when it comes to social media strategy, but there’s an additional element that rivals content for top spot: targeting. Without strategic targeting, the content you share will fall on deaf ears, and we all know that you put too much time and energy into crafting the perfect message for that to happen. With this in mind, Twitter and other social platforms have introduced retargeting tools. Retargeting has become an essential tactic for digital marketers looking to increase brand awareness, strengthen brand recall, and drive customer conversions. It sounds simple in theory, but in practice it’s actually a bit more complex. Before you start dabbling with Twitter’s retargeting toolbox, let’s take a closer look at what’s being offered, starting with what retargeting really means. Retargeting enables you to focus your content on engaged individuals by providing you with the tools to serve ads to people who have previously interacted with your brand. This requires a small piece of code to be added to your website or landing page and places a cookie in each visitor’s browser. At this point, visitors are added to an audience list which can be retargeted with a specific campaign designed solely for them. Tie-ins with social platforms have made retargeting even more valuable. In December 2013, Twitter introduced Tailored Audiences, which essentially enables you to continue conversations with existing and potential customers that start outside of Twitter. With this tool, you can create unique audience segments based on your website and behavioral data, and then target those audiences on the platform. 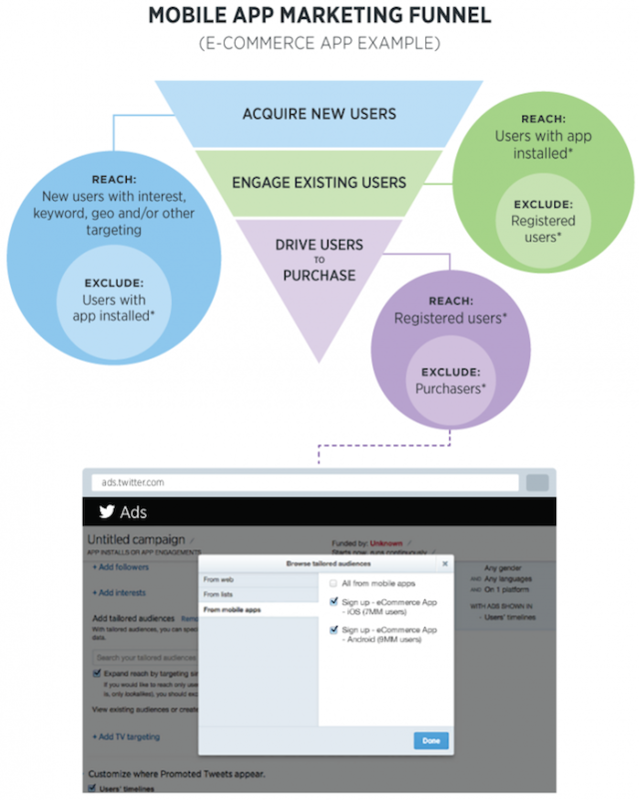 Twitter’s retargeting relies on connecting member profiles to offline data provided by marketers. In order to target a specific subset of users, you must upload either a set of cookie IDs or email addresses from your database. Twitter will then match your data with either the cookies or email addresses of its members. For example, let’s say that someone visits your website but leaves before completing your desired action. That piece of code on your site – the one that placed a cookie in your visitor’s browser – now enables you to serve Promoted Tweets to this individual on Twitter in conjunction with other tools like the Website Card and Lead Generation Card. When that person interacts with your retargeted ad, he or she will return to your site to complete the desired action. And as an added bonus, that individual can then retweet your retargeted ad to their followers, driving more attention to your brand and website. This subset of Tailored Audiences is created by uploading a file containing your own data. Your records are then matched with people who are active on Twitter so that you can target them in your campaigns. For example, you can reach your existing customers by uploading a list of their email addresses. This is a wonderful opportunity to reach them with a new campaign and drive them to purchase again. You can also collect lists of Twitter usernames to identify and target members who are influential or active around a certain topic. Supported file formats are .csv and .txt, and the maximum file size is 5 GB. Your list can be separated by new lines or commas. It’s worth noting that not every list you upload will be eligible for use in a campaign. In an effort to respect user privacy, the list must match more than 500 people on Twitter for it to be usable. To reach this minimum size requirement, most lists have several thousand or more entries. Lists can be uploaded through Twitter’s Audience Manager tool (more on that below) or through one of its Marketing Platform Partners. Twitter defines a “web audience” as a group of active Twitter users who have visited your website. This group is collected by a website tag that you put on your site. This is a snippet of code that allows you to remarket to Twitter members based on visits to the sites where your tag is present. Once placed, the tag begins to collect the cookie IDs of visitors and matches them to specific Twitter users. From there, you can set up Twitter Ads campaigns targeted to these recent website visitors. It’s recommended that you wait at least one week after installing your website tags before attempting to run any campaigns. The website tag is a great fit if your goal is to reach high-intent visitors and convert them into new customers. It’s also worth noting that there are additional rules for marketers using the website tag for conversion tracking and remarketing, which we recommend reading before launching your campaign. Early tester @1800flowers used the tag in its Mother’s Day campaign to implement conversion tracking and build a tailored audience of recent site visitors. According to Craig Shiffrin, director of online marketing at 1-800-Flowers, the website tag was easy to set up and very useful. By targeting members with Promoted Tweets containing a Website Card, the company achieved a cost per acquisition significantly lower than its performance goal. Similarly, apparel retailer @Betabrand used the website tag for remarketing to drive a 63 percent decrease in cost per acquisition. The third type of Tailored Audience wisely focuses on mobile, allowing you to create targetable audience segments based on mobile app actions, such as installs, purchases, or sign-ups. This can help you drive the highest possible ROI in your app install and engagement campaigns. Not only can you ensure that your ads aren’t displayed to individuals who have already installed your app, but you can augment tailored audiences from mobile apps with look-alike targeting to reach high-value users most similar to those who have your app installed. And, as Twitter pointed out, you can use tailored audiences from mobile apps to connect with individuals at specific stages of your app marketing funnel. For example, you can target those who have installed your app but haven’t signed up or made a purchase. 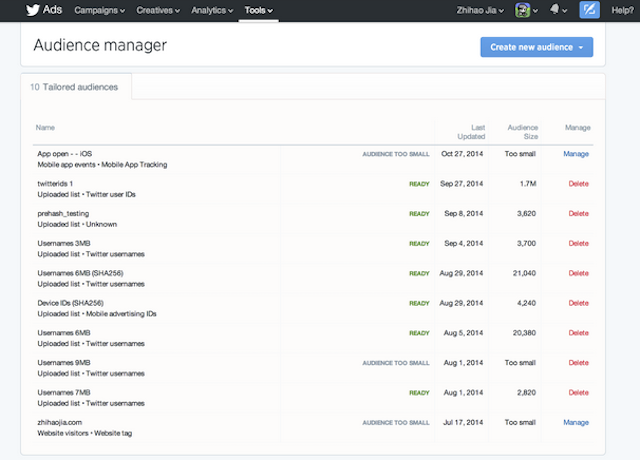 The Audience Manager tool is available in your Twitter Ads account and enables you to review and manage your audiences. Once an audience is loaded into Twitter Ads, you can use the audience manager to view details of all your audiences in one place, change or delete them, and get notifications on their statuses. Retargeting might seem like a daunting undertaking, but its benefits far outweigh the effort. Not only does it offer you a second chance at converting a visitor to a customer, but it also builds an asset for your brand by collecting valuable audience data. Stay tuned for a more detailed look at a retargeting campaign using Tailored Audiences on Twitter.